In the summer residents are provided private studios in The Convent. The Convent, originally built in 1953, was renovated in 2007. There are four 10’x 11’ raw studios in the building. AIR’s are encouraged to bring all supplies they might need for creating new work since the classroom studios (glass, metals, ceramics, printmaking, etc.) will not be accessible due to summer classes. The Rob, our wood shop, is available for summer residents to use (see below for a description). During the fall, residents are assigned studios based on the type of work they intend to produce. The spaces available are a mix of shared and private, raw studios. Classroom studios such as ceramics are available for use in the fall but need to be requested in the studio section of the application. Residents are asked to work only in the space provided to them to ensure each resident has their own work area. There are alternative spaces that may be used for larger projects, installations, etc. including Ox-Bow’s landscape, which is highly encouraged. The printmaking studio, digital media space and wood shop are available for all residents to use. The Krehbiel Ceramics Studio Ox-Bow's ceramics studio was built in 2000 to honor Albert Krehbiel, who was influential in the early development of Ox-Bow. The ceramics studio has several electric kilns, a small test kiln, a gas-fired car kiln, sawdust and raku capabilities, as well as a wood kiln (used during the summer months). There is a glaze room and patio space for larger projects. This is a shared studio space. Each resident is given a section of the studio for use while equipment is shared. The ceramics studio is dedicated to those artists working primarily in the medium. If you would like access to this space, make sure it is clearly stated in your application. The Works on Paper Studio was built in 2009 to house printmaking, sculpture, photo, video and other courses. The 1st floor houses the print studio; complete with lithography, collograph, etching, screenprinting, and woodcut facilities, as well as letterpress. The 2nd floor houses the clean space, which has traditionally been used for residents working with digital media and performance. The clean space has three mac desktop computers (with adobe suite, final cut pro and internet access), digital printers and 11 x17” scanners. There are long work counters and large tables. Across the hall is a gallery space with a built in projector and sound system for resident use. All residents have access to these spaces. The Haas Painting Studio , built in 1975, is a spacious north lit painting and drawing studio with plenty of wall space, tables and easels. 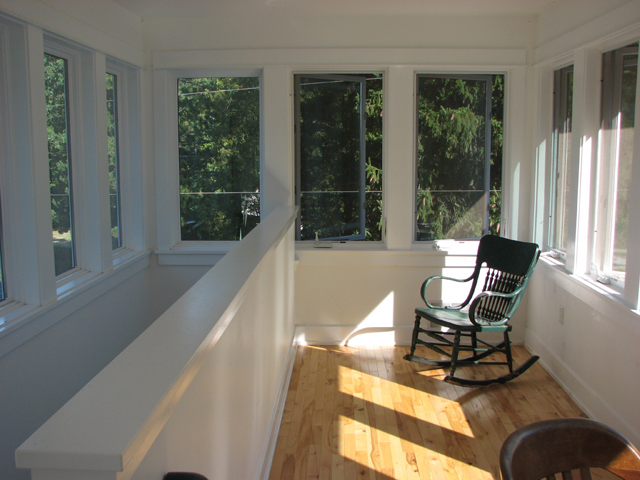 In 2007 it was renovated and winterized in order to become six 10' X 10' studios for our fall residents. This is a semi-private, raw space. Each resident is given a section of the studio for use. The Lutz studio, built in 2006 and named after former instructor Dan Lutz, is a semi-private studio. The two-storied building is a raw space that can accommodate 4 residents, 2 on each floor. The Convent, built in 1953, is a private studio building. There are four 10’x 11’ raw, single-room studio spaces. The Rob, built in 1971, was originally used as Ox-Bow’s ceramics studio. It is home to the campus woodshop. The shop is basic and includes a table saw, miter saw, a variety of hand tools etc. While our writing residency is small, writers are able to work among visual artists working in many diverse fields. Our writing studios are one-room, private spaces with a writing desk. Residents are also welcome to work in any of the common spaces on campus.